From the church’s earliest days, followers of Jesus told the story of his passion, death and resurrection. When pilgrims came to Jerusalem, they were anxious to see the sites where Jesus was. Eventually, walking in the footsteps of the Lord along the way of the cross became a part of the pilgrimage visit. The stations of the cross, as we know them today, came about when it was no longer easy to visit the holy sites. In the 1500’s, villages all over Europe started creating replicas of the way of the cross, with small shrines commemorating the places along the route in Jerusalem. Eventually, these shrines became the set of 14 stations we now know and were placed in almost every Catholic Church in the world. The stations of the cross are a form of prayer. Just go from one station to the next on this page. When “arriving” at a station, begin by looking carefully at the image itself — the stations were photographed by Sarah Webb at St. Monica Church, Berwyn — then follow the prayers and meditations. 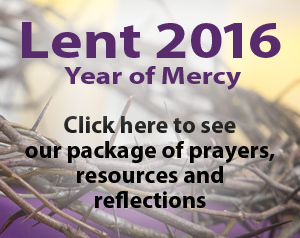 Catholic parishes traditionally celebrate this devotion on Fridays during Lent. CatholicPhilly.com will present this online stations of the cross each Friday for the benefit of visitors’ spiritual growth in the Lenten season. Pilate washes his hands of the whole affair. Jesus’ hands are tied behind his back. I look into his eyes. It’s all there. The weight is unbearable. Jesus falls under it. How could he enter our lives completely without surrendering to the crushing weight of the life of so many on this earth! He lies on the ground and knows the experience of weakness beneath unfair burdens. He feels the powerlessness of wondering if he will ever be able to continue. He is pulled up and made to continue. As I watch them in this place along the way, I contemplate the mystery of love’s power to give strength. She knows the sorrow in every mother’s heart, who has lost a child to tragedy or violence. I look into his face and contemplate his struggle. His weariness and fragility. His impotence. I pause to let it soak in. He knows the mystery of death. He has fallen into God’s hands. I pause to contemplate this act of closure on his life. In solidarity with all humanity, his body is taken to its grave. I stand for a moment outside this tomb. This final journey of his life has shown me the meaning of his gift of himself for me. This tomb represents every tomb I stand before with fear, in defeat, struggling to believe it could ever be empty.